Achieving your estate planning objectives. the ability to reduce the overall tax rate. The degree to which asset protection is important to you depends on the type of business you are in or going into. The general principle is that trading activities are best carried out by trusts, companies or a partnership of trusts and their assets should be confined to core trading assets only, with other assets held by other legal structures. 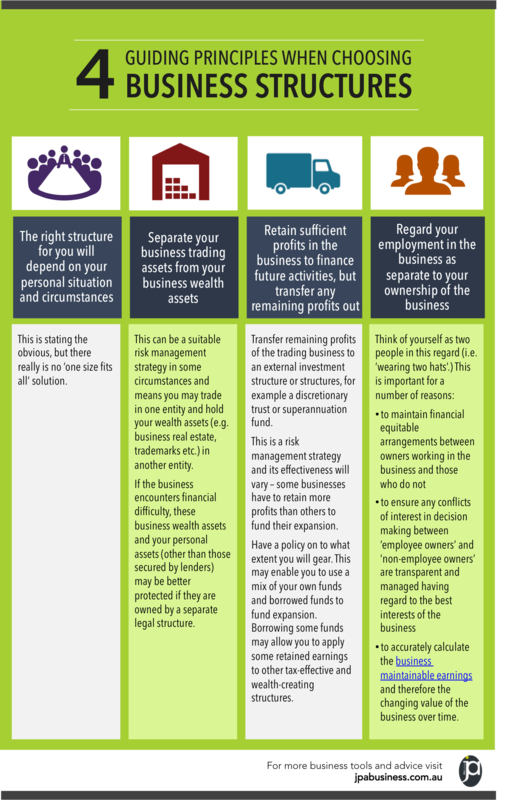 Along with the JPAbusiness team, the advice in this blog and cheat sheet was provided by business consultant and management accountant Richard Cummins in our free eBook, How to choose the right structure for your business. Richard has been helping his clients structure their businesses so as to maximise asset protection and minimise income tax for almost 40 years. We have worked with Richard for many years and have great respect for him and the wealth of knowledge he has accumulated in this area. If you would like advice about choosing the most effective structure for your business, contact the team at JPAbusiness on 02 6360 0360 for a confidential discussion.